A monorail is a rail-based transportation system based on a single rail, which acts as its sole support and its guideway. The term is also used variously to describe the beam of the system, or the vehicles traveling on such a beam or track. The term originates from the contraction of the words mono (one) and rail, from as early as 1897 as early systems used metal rails. The transportation system is often referred to as a railway. Colloquially, the term “monorail” is often used erroneously to describe any form of elevated rail or peoplemover. In fact, the term solely refers to the style of track, not its elevation. Monorail systems have found shared applications in the transportation market in airport transfer and some medium capacity metro systems. To differentiate monorail systems from other transport modes, the Monorail Society further clarifies the definition of a monorail such that the beam in a monorail system is narrower than the vehicle. Monorails are often but not exclusively elevated, sometimes leading to confusion with other elevated systems such as the Docklands Light Railway, Vancouver SkyTrain and the JFK AirTrain. Monorail vehicles are often at first glance similar to other light rail vehicles, and can be both manned and unmanned. Monorail vehicles can also be found in singular rigid format, articulated single units, or as multiple units coupled into ‘trains’. In common with other advanced rapid transit systems, some monorails are driven by linear induction motor. In common with many dual rail systems, the vehicle bodies are connected to the beam via bogies, allowing curves to be negotiated. 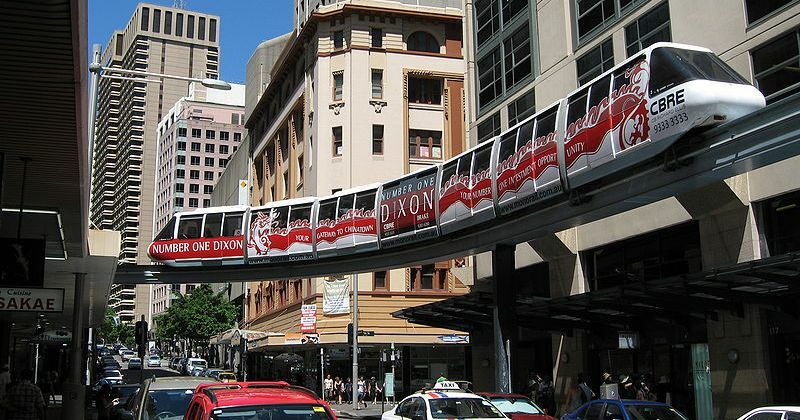 Unlike some trams and light rail systems, modern monorails are always partitioned from other traffic and pedestrians. Monorails are both guided and supported via interaction with the same single beam, in contrast to other guided systems such as Rubber-tyred metros, such as the Sapporo Municipal Subway; or guided buses or trams, such as Translohr. 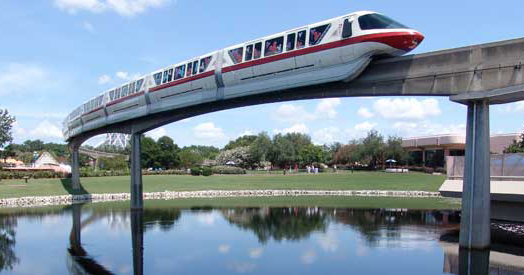 Monorails also do not use pantographs. A monorail track is usually less expensive to build than a comparable elevated conventional rail line of equal capacity. Due to a smaller footprint, they are seen as more attractive than conventional elevated rail lines and block only a minimal amount of sky. Monorail is, by design, a grade-separated system. They do not interfere with existing transport modes. Unlike conventional rail systems, straddle monorails wrap around their track and are thus not physically capable of derailing, unless the track itself suffers a catastrophic failure. Rubber-tired monorails are typically designed to cope with 6% grade. Monorail tracks do not easily accommodate at-grade intersections. In an emergency, passengers may not be able to immediately exit because an elevated monorail vehicle is high above ground and not all systems have emergency walkways. The passengers must sometimes wait until a rescue train, fire engine or a cherry picker comes to the rescue. Newer monorail systems resolve this by building emergency walkways alongside the entire track, at the expense of visual intrusion. Suspended railways resolve this by building aircraft-style evacuation slides into the vehicles. Japanese systems use the next train to tow broken down trains to the next station, but this has yet to occur. Turnouts, especially at high speeds, may be marginally more difficult compared to conventional railway points, although certainly not impossible. Monorail infrastructure and vehicles are often made by separate manufacturers, with different manufacturers using incompatible designs.